Relay race | Let Teddy Win! 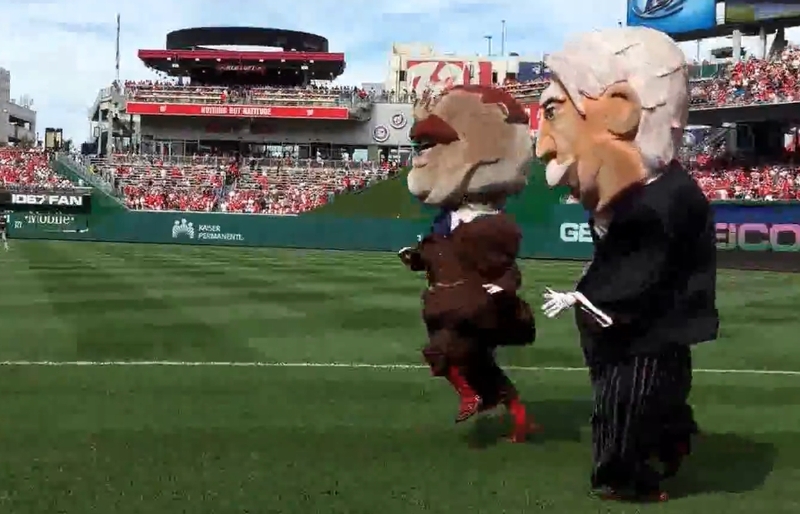 The Nationals’ racing presidents held a blindfold relay race Wednesday night at Nationals Park, with Washington and Jefferson lining up against the unlikely pairing of Lincoln and Roosevelt. Just before the gun, William Howard Taft entered the field without a blindfold, and the former Chief Justice spun Tom and Teddy around, leading them to collide with their counterparts. Bill took the tape to notch his ninth win of the season. GIF: Abe Lincoln refuses to pass the baton to George Washington. Literally. Known for his dirty tricks, “Honest” Abe Lincoln has established himself as the winningest racing president since the opening of Nationals Park; but this season, George Washington has been the class of the field, holding a comfortable lead in the season standings since April. Yet George has been unable to put away a resurgent Abe, and entered Thursday night’s contest still needing just one victory to seal the season. In what began as a traditional relay race, Abe Lincoln was called upon to pass the baton to George Washington for the anchor leg, but the Great Emancipator wasn’t willing to hand the victory to his rival. 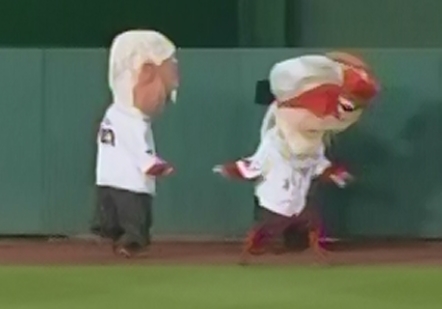 Instead of passing the baton, Abe reared back and clobbered the founding father, stealing the victory for himself. 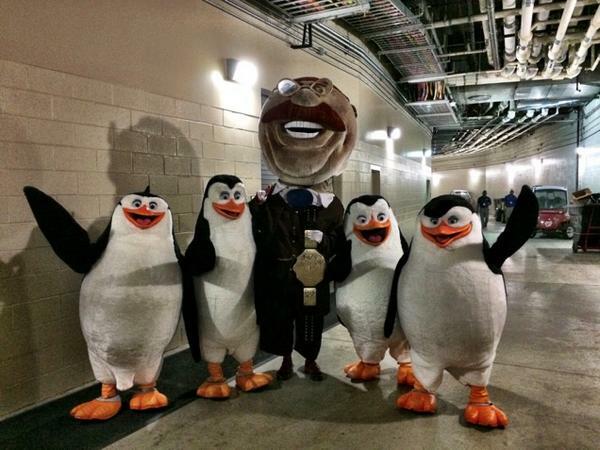 With the Detroit Tigers visiting Nationals Park for the first time Wednesday night, the racing presidents chose to trot out one of the most obscure cultural reference in their seven year history of obscure cultural references. 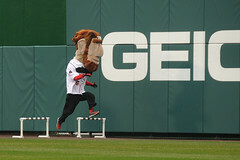 Since a fifth racing president was added this year, the relay race concept was unbalanced, with Teddy Roosevelt running on his own against two teams. After Abe handed off to anchor Bill, and Tom handed off to George, Teddy tripped and fell, leaving Taft with only George to beat, but it was Washington who did the beating, taking down Taft with a single swing of the cinnamon shaker. 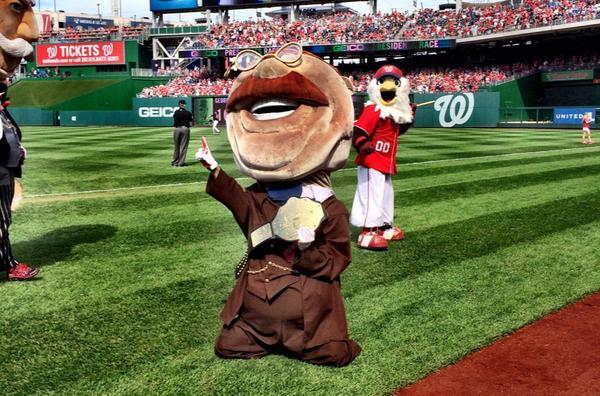 Inexplicably, the Nationals awarded a victory to the cheating George, but not to his relay partner Thomas Jefferson. As expected to start this homestand, the race resumed its normal direction toward the first base line. 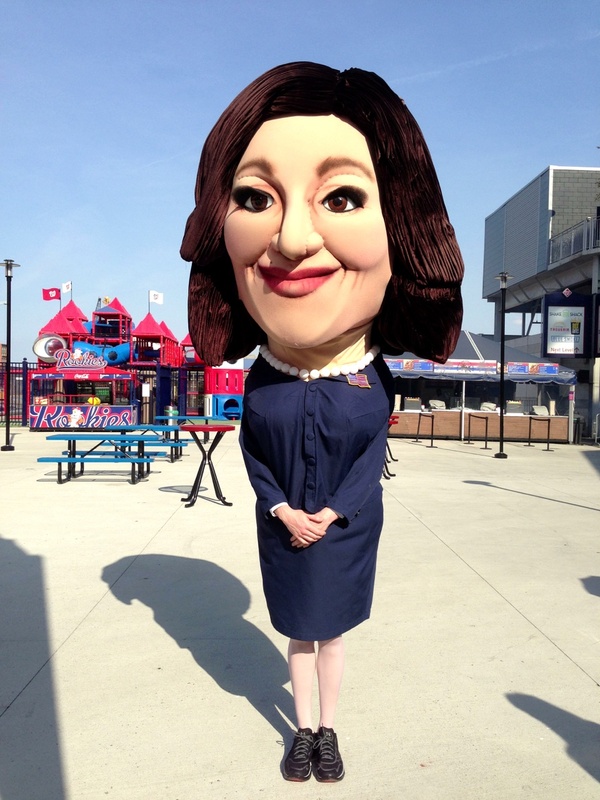 A 10-foot likeness of actress Julia Louis-Dreyfus participated in the presidents race Tuesday night at Nationals Park, teaming with Teddy Roosevelt in a relay race that came down to the wire. 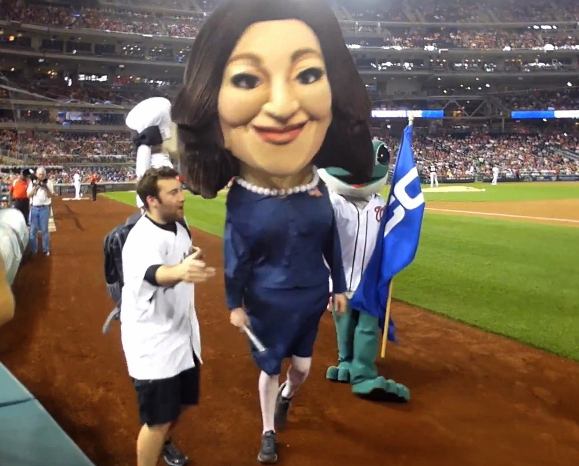 Louis-Dreyfus plays United States Vice President Selina Meyer in the HBO comedy series VEEP, and to promote this Sunday’s season premier, the network partnered with the Washington Nationals to have the king-sized Meyer join the racing presidents for an official presidents race relay. 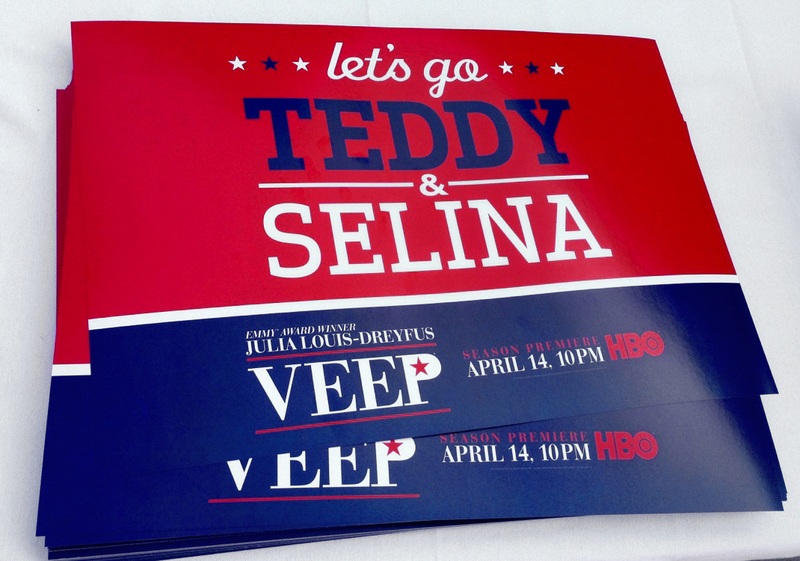 Meyer was teamed with fan favorite Teddy Roosevelt, and fans entering the center field gates were given “Teddy and Selina” rally signs to help cheer the pair to victory during the fourth inning race. Meyer posed for photos with fans before the game. For the three-team relay, a trash-talking William Howard Taft was teamed with Abraham Lincoln, while founding fathers George Washington and Thomas Jefferson formed a second opponent. 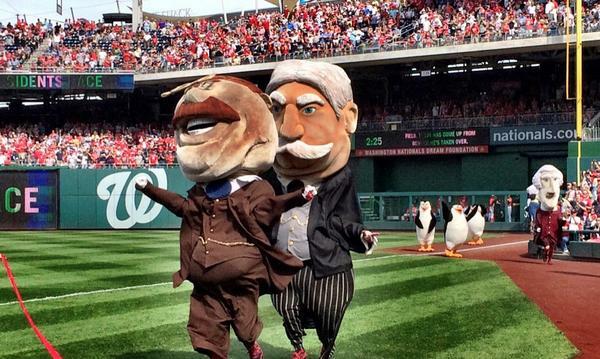 In the first leg, Teddy Roosevelt jumped to a big lead, but dropped the baton on the handoff. By the time Selina had picked it up, Washington and Lincoln had taken off on the anchor leg. In a reversal of roles from previous seasons, George Washington continued to stake his territory as the early leader in the dirty tricks department, pushing Abe onto the warning track in right center field. 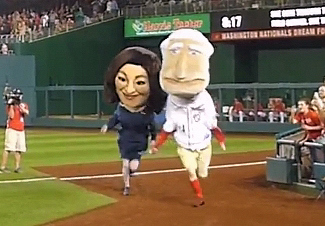 With Abe out of the way, George saw nothing but daylight, but Selina put on a burst of speed that brought the Nationals Park crowd to its feet, briefly taking the lead in the home stretch before running out of gas just before the finish line. Photos video courtesy of YouTube member lfahome. It’s fair to say that the 39,055 Nationals faithful who packed the home park for opening day are accustomed to end-of-game suffering. Unfortunately, a near-freezing drizzle forced them to suffer non-stop from Thursday afternoon’s opening pitch. The home team sported a new look for 2011, with six new position players, an improved defense, new home uniforms, and a variety of other changes to the stadium experience; yet these improvements were little consolation for failing to score against the Atlanta Braves pitching staff. While the team’s refreshingly solid defensive performance may portend good times ahead, there were no such signals from Teddy Roosevelt. 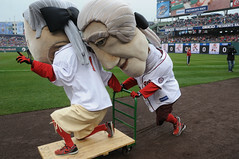 The 2011 presidents race season kicked off with an unusual relay race in which Abe Lincoln and Thomas Jefferson jumped over hurdles in the outfield before attempting to push Teddy and George, respectively, to the finish line aboard rolling carts. As Tom pushed George over the finish line, Teddy failed to gain his balance and fell off the cart onto the warning track. 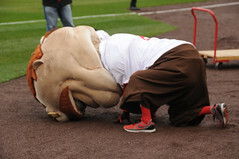 The shared victory knocked winless fan-favorite Teddy into 3rd place in the presidents race standings after just one race. It could be a long season ahead. 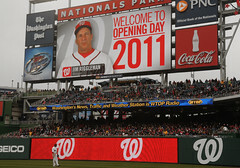 The Nationals promised changes to the in-stadium experience for 2011. Unfortunately, letting Teddy win does not appear to be one of them. This fan captured his own video from the upper deck. It’s notable not for the camera work, but for the drunken despair expressed over Teddy’s fate. When the team introduced its new uniforms back in November, they also promised a renewed marketing focus for the Nationals around the color red and the Curly W logo. Today, further progress was revealed in the form of new uniforms for the Nat Pack, new Curly W signage around the parking garages, Curly W backgrounds on all of the featured HD scoreboard videos, and revised scoreboard graphics featuring bright whites and reds to match the uniforms. 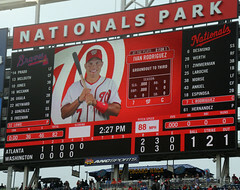 To this observer, these changes are well done and help to solidify the Nats’ marketing identity.